I finally managed to release a first version of Collapp, a solution for collaborative project planning, and now I am looking for testers / early adopters. I have been working on it on and off for the last couple of years. In part to learn more about JEE and in part to continue work on FlexGantt (online demo), a framework for creating Gantt charts. I believe that I have now reached a point where a bigger group of people could take Collapp for a ride. Anyone interested can now try the online demo or download the full installation. The online demo allows you to register a new user account and get immediate access to the application. If you also want to see the administration features then please send me an email so that I can grant you the required permissions. Collapp is a JEE (rich) client / server solution running on the Glassfish application server and the MySQL database. The screenshots below show what it looks like when running it on a Macintosh (note: use Java 6, not 7) and on Windows. 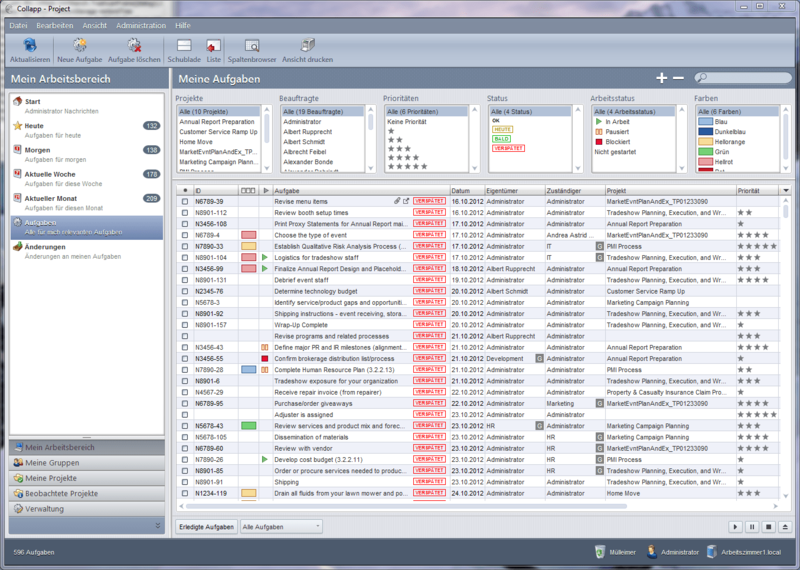 The first release focuses on the management of so-called “Action Items” only. 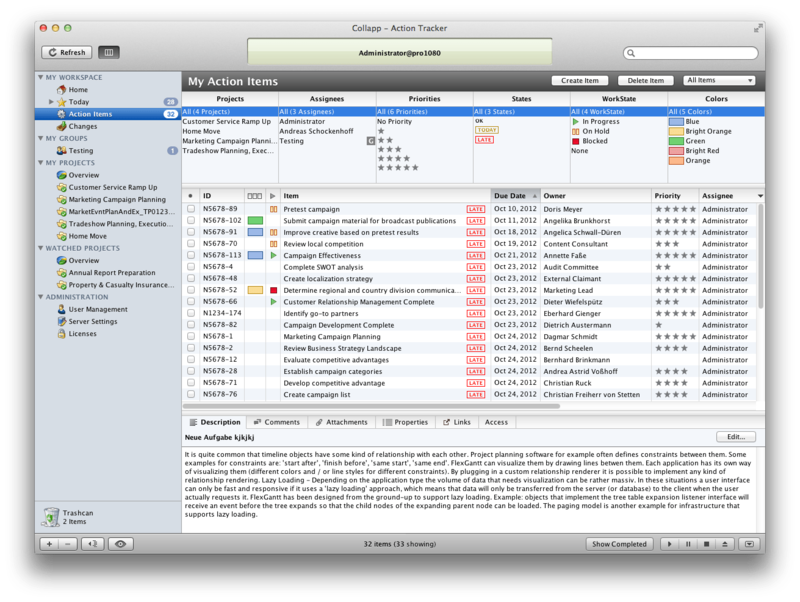 It does not contain any actual project planning functionality, yet (e.g. a Gantt chart, Work Breakdown Structures, Resource Calendars). I decided to go with this approach in order to get to a point where the application reaches production quality for at least some part of its functionality. Project planning will eventually be based on the action item feature as project tasks will result in action items that are assigned to individual team members. A strong emphasize of my work was on the Macintosh UI of Collapp. I tried to come up with a user experience that is as close to native Mac apps as humanly possible. I would love to get some feedback on whether I was successful or not. For Windows I picked a more liberal approach by using the commercial BizLaf look and feel framework from Centigrade. The Macintosh download also contains the standalone rich client, so that you don’t have to answer any annoying Java Webstart security questions. There currently is no Windows standalone client. Hi David. I stopped working on Collapp in 2013. It got to a pretty good state and had most of the planned features implemented. Unfortunately I was unable to find a sponsor / a first customer for this work. In 2013 I started working on migrating FlexGantt to JavaFX and also added a new framework called CalendarFX. If time permits and if I find a new sponsor I might start working on a JavaFX version of Collapp, who knows?